If you need an experienced commercial insulation company for a Washington, D.C. project, then Arango Insulation is the contractor you can turn to for high-quality products and the fastest service. With our rapid turnaround times and outstanding insulation products, you can rest assured that you’ll get the insulation you need and keep your projects on schedule. While we can have your insulation installed in as few as one to three days, we never sacrifice workmanship and always ensure our work meets or exceeds all applicable codes. We are so confident in the quality of our work that we even back our installations with a one-year labor warranty. To meet the requirements of virtually any type of commercial application, we provide batts, rolls, spray foam, foam boards, loose fill, and radiant barriers. Plus, we’re an authorized dealer of insulation from some of the industry’s most trusted names, including Johns Manville, Owens Corning, Icynene, Guardian, and others. So, no matter what type of challenges your job presents or what type of insulation it demands, we will never use anything less than superior products to achieve lasting results. 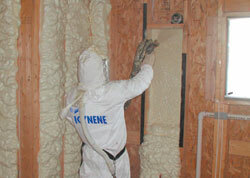 For more information about our commercial insulation services for Washington, D.C., please contact us today. In addition to installing commercial insulation, we offer a wide array of fireproofing services for all types of applications, including basements, crawlspaces, and attics, as well as waterproofing of basements.